The purpose of accreditation for the Olympic Games was to ensure safety of the Games, verify status of participants, and guarantee smooth operation of the Games by granting proper access privileges. To attain the three objectives, the SLOOC adopted computer systems for the accreditation procedures for speedy processing, improved accreditation card production equipment to enhance efficiency and ensure security, and installed accreditation centers at strategic locations for the convenience of users. The SLOOC activated the Accreditation Operation Unit early in its operation, sending out 39,779 ID cards to 199 organizations in 161 countries, and issuing 133,132 AD cards in 21 categories. The cards included 39,332 cards for Olympic Family and 93,800 for operation personnel. In addition, 32,672 temporary passes were issued and delivered to relevant access control apparatuses. The human resource input into the accreditation process came to 525 persons, while 6,082 pieces of equipment and materials in 85 kinds were utilized for the job. The ID card was recognized as a travel document to ascertain the personal status of the Olympic Family including athletes, officials and official invitees participating in the Seoul Olympic Games and to permit their entry into the Republic of Korea. For 78 days before and after the Games from August 17 to November 2,1988, the bearers of ID cards were granted multiple entry and exit. Pursuant to the relevant provision of the Olympic Charter, ID cards were issued only to those who belonged to the category of Olympic Family, and the bearers of the cards were granted entry without visas. Security devices were arranged in manufacturing the ID cards to ensure the safety of the cards. The holders of ID cards were assured of the performance of their duty. In accordance with revised bye-law to Rule 59 of Olympic Charter, the ID cards were classified into 10 categories, and the colors for each category were selected by the SLOOC by considering the precedents of the past Games, and finalized after consultation with the IOC. The eligibility of the ID cards was determined primarily in accordance with the 1982 version of the Olympic Charter, but the persons eligible for the cards were selected by considering the revised Rule 59 and 60 of the 1987 Olympic Charter, as well as precedents of the past Games. Final decision on the eligible persons was made after several rounds of consultations with the IOC. In January 1987, the Accreditation Department commissioned the Design Room of the Press and Public Relations Department to draw out the design of the ID card. The Accreditation Department called for the following elements to be well reflected in the design: artistic and traditional quality, harmony between colors and form and maintenance of clarity, easy recognition, prevention of tampering and forgery, partial use of Korean alphabet to emphasize the identity of the host country. In June 1987, the Korea Security Printing and Minting Corp. printed the three designs completed by the Design Room, which were brought to the Design Advisory Committee for a screening in July. The committee selected one among the three designs. Some supplementary touch was added to the design to make characters such as the name of the Games clearly discernible from the background pattern. In August 1987, the Korea Security Printing and Minting Corp. was asked to produce the test card. The SLOOC received the test product in September, and finalized the design after consultation with the IOC in October. The ID card was 168mmx140mm, and for easy recognition, different colors were used for each category. The obverse of the card expressed a Korean image through harmony between the color of the category and the field color on the traditional decorative pattern. The reverse side provided for a common space to confirm the entry and exit, and the card had columns to fill up with the personal items, and columns for signatures of the representatives of the SLOOC and other relevant agencies. In accordance with the bye-law of Rule 59 of the Olympic Charter, items required to ascertain the identity of the bearer were entered into the ID column. Printed on the obverse side were the Games emblem, the name of the card (Korean, English and French), and category. On the reverse side were the name of the Games (Korean, English and French), and entry/exit confirmation. 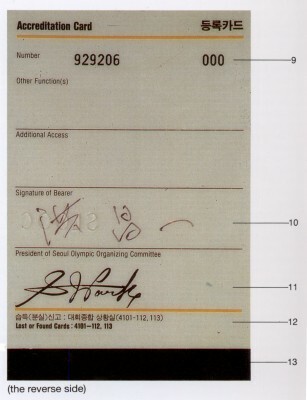 Inside the card was classification of category, photograph, signature of the bearer, the term of validity of ID card, ID card number, name, date of birth, place of birth, nationality, address, occupation, Olympic function (sports), signatures by the IOC president, SLOOC president, and chairman and secretary general of the issuing agency. The ID cards were printed by the Korea Security Printing and Minting Corp. which is unrivaled in security measure. 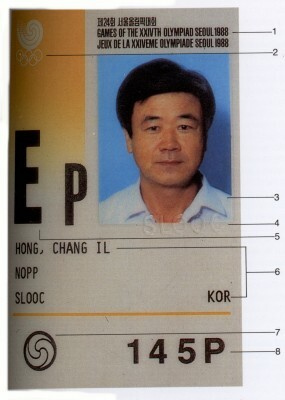 By December 1987, the Korea Security Printing and Minting Corp. manufactured 48,800 cards including 1,000 samples. Following the delivery of the cards in February 1988, 1,000 F cards were additionally printed with request from NOCs for more cards. Because the ID card was recognized as a travel document replacing a visa, the SLOOC paid special attention on security measures to ensure the safety of the Games. Special pattern and special ink were used for the card paper, and special letters were used as a secret code. In addition, silver watermark was inserted to enable the passport inspecting device to detect possible counterfeiting or tampering. Security sticker was attached to the photograph.